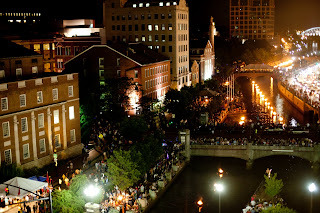 Last Saturday after a Boston Handmade meeting in Seekonk, Arthur, Beth, Beth's husband Justin, and I piled in the car and headed to Providence for Waterfire. 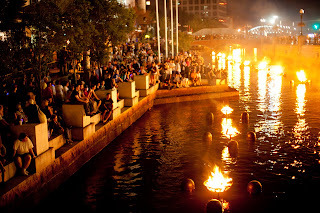 Waterfire is a public art exhibit that takes place on certain dates throughout the summer and consists of one hundred large bonfires set in the rivers of the city. It draws a huge crowd but the mesmerizing fires keep the noise level significantly hushed and peaceful; it was unlike any event I've ever been to. This is the view from Justin's office (he snuck us in), how cool is that?! Even from the shore, the heat from the fires was intense; we were lucky it wasn't a really hot night. 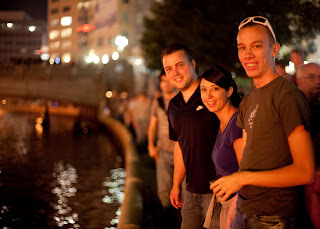 In addition to the fires, there were singers stationed around the canals, gondola rides, and even a few living statues. 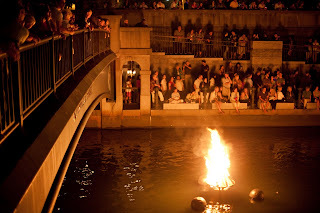 There are still a few dates left this season to catch Waterfire; I highly recommend that you do!